What is a Salt Dome? How do they form? Columns of salt that intrude through overlying sediment units. Middle Jurassic salt: This cross-section shows rocks of the East Texas Basin between the Oklahoma-Texas border (on the left) and the Gulf of Mexico coastline (on the right). The purple rock unit is the Middle Jurassic salt, a rock unit that has the ability to flow under pressure. The salt is overlain by thousands of feet of sediment which place enormous pressure on the surface of the salt and cause it to flow. At numerous locations the salt has intruded upwards into overlying sediments. This has produced small mounds or towering columns of salt that can be thousands of feet tall. The salt columns and smaller mounds are called "salt domes." USGS image . Salt Dome: Cartoon of a salt dome showing piercement through two rock units and deformation of the rock unit immediately above. Growth of the dome is accomplished by migration of salt into the dome from surrounding areas. The salt migrates into the dome because it is compressed by the weight of overlying sediments. A salt dome is a mound or column of salt that has intruded upwards into overlying sediments. Salt domes can form in a sedimentary basin where a thick layer of salt is overlain by younger sediments of significant thickness. Where conditions allow, salt domes can rise thousands of feet above the layer of salt from which they began growing. An example is shown in the illustration. In the illustration at the top of the page, the purple rock unit (Js) was originally a layer of salt. It is the source of salt for several columns of salt and several smaller mounds of salt that have intruded into overlying units. The development of salt domes can deform rock units into traps that hold oil and natural gas. They are often mined as sources of salt and sulfur. The impermeable nature of the salt can make them important sites for underground storage or underground disposal of hazardous waste. Unlike most other types of sediment, salt has the ability to change shape and flow when placed under enough pressure. 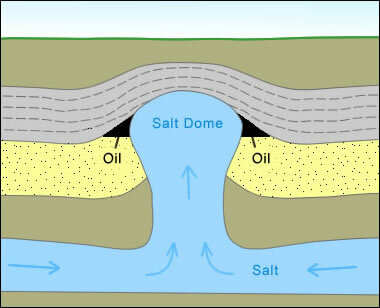 To develop a salt dome, the pressure on the salt must be high enough to enable it to intrude the overlying sediments. The pressure must be great enough to overcome several obstacles. These include the weight of overlying strata, the strength of overlying strata, frictional forces, and the force of gravity resisting uplift. Two sources of pressure that have produced salt domes are the downward pressure of overlying sediment and the lateral pressure of tectonic movement. If an area of weakness or instability develops in the overlying sediment, salt under adequate pressure can intrude into it. The weakness might be caused by extension fractures, a developing anticline, a thrust fault, or a valley eroded into Earth's surface above. Once the salt begins to flow, it can continue as long as the pressure on the salt is high enough to overcome the resisting forces. Flow will stop when the salt has risen to a height where equilibrium conditions exist. Many explainations of salt domes suggest that the lower density of salt, compared to the density of overlying rock units, is the driving force of salt dome formation. That is a misconception. At the time of deposition, clastic sediments above the salt are uncompacted, contain siginficant pore space, and have a lower density than the salt. Their density does not exceed the density of the salt until they are deeply buried, tightly compacted and partially lithified. By then they are no longer soft sediments. They are competent rock units that can be obstacles to salt intrusion. Weight vs Density: Air has a density that is almost negligible. However, a column of atmospheric air weighs enough to drive a column of extremely dense mercury almost a meter up a glass vacuum tube. A mercury barometer provides an illustration of how density can be irrelevant. In 1643, Evangelista Torricelli filled a glass tube, closed on one end, with mercury. He then stood it upright in a basin of mercury, keeping one end submerged. After the tube was upright, the weight of the atmosphere on the surface of the mercury provided enough pressure to support a column of mercury almost one meter in height. The mercury would rise and fall in the tube as the pressure of the atmosphere changed. In the case of a mercury barometer, the density difference between the mercury in the tube and the density of the surrounding air is enormous. But, the weight of the atmosphere is high enough to support the column of mercury. In the case of a salt dome, thousands of feet of sediment, pressing down on a geographically extensive salt unit, can provide enough energy to produce a salt dome. Arctic Salt Domes: A satellite image of two salt domes that erupted to the surface of Melville Island, northern Canada. The domes are the round white features surrounded by gray rock. They are each about 2 miles across. 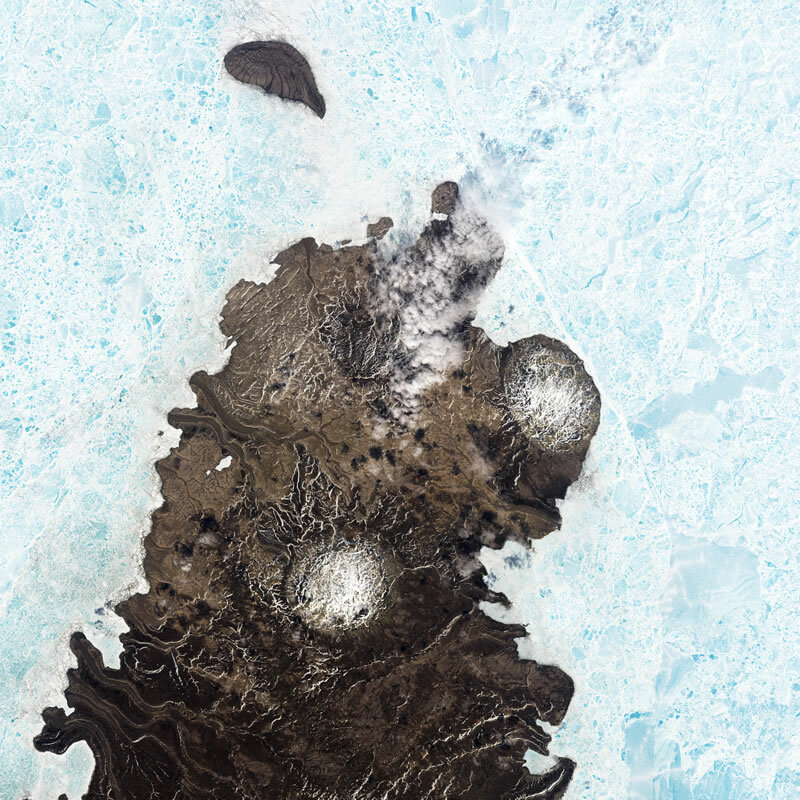 The island is surrounded by sea ice. Salt can persist at the surface in cold and arid climates. Image by NASA . Enlarge image. How Large Are Salt Domes? Salt domes can be very large structures. The salt cores range from 1/2 mile to 5 miles across. The parent rock units that serve as a source of salt are usually several hundred to a few thousand feet thick. The salt domes ascend from depths of between 500 and 6000 feet (or more) below the surface . They usually do not reach the surface. If they do, a salt glacier might form. Gulf of Mexico Salt Domes: A relief map of the floor of the Gulf of Mexico off the southeastern coast of Louisiana. Red and orange colors represent shallow water; blue represents deeper water. 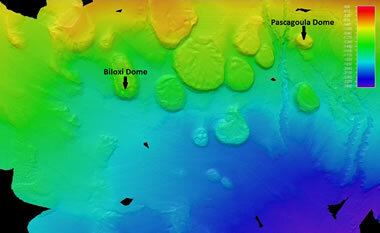 The round flat-top structures are the surface expression of subsurface salt domes. Image from the NOAA Okeanos Explorer Program. Enlarge image. Salt domes were almost unknown until an exploratory oil well was drilled on Spindletop Hill near Beaumont, Texas in 1900 and completed in 1901. Spindletop was a low hill with a relief of about 15 feet where a visitor could find sulfur springs and natural gas seeps. At a depth of about 1000 feet, the well penetrated a pressurized oil reservoir that blew the drilling tools out of the well and showered the surrounding land with crude oil until the well could be brought under control. The initial production from the well was over 100,000 barrels of crude oil per day - a greater yield than any previous well had ever produced. The Spindletop discovery ignited a drilling spree on similar structures across the Gulf Coast area. Some of these wells struck oil. Those discoveries motivated geologists to learn about the structures below that held such vast amounts of oil . Careful subsurface mapping of well data, and later the use of seismic surveys, enabled geologists to discover the shape of salt domes, develop hypotheses about how they form, and understand their role in petroleum exploration. 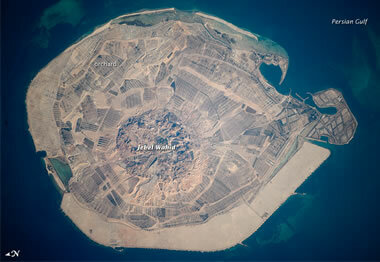 Persian Gulf Salt Dome: Sir Bani Yas Island in the Persian Gulf on the western coast of the United Arab Emirates. The island is a mound pushed up by a rising salt dome. The dome has broken through the surface of the island, and the round core of the dome can be seen in the center of the island. Image by NASA Earth Observatory . Click for larger image. Salt domes serve as oil and natural gas reservoirs, sources of sulfur, sources of salt, underground storage sites for oil and natural gas, and disposal sites for hazardous waste. Salt domes are very important to the petroleum industry. As a salt dome grows, the cap rock above it is arched upwards. This cap rock can serve as an oil or natural gas reservoir. As a dome grows, the rocks that it penetrates are arched upwards along the sides of the dome (see both illustrations at the top of this page). This upward arch allows oil and natural gas to migrate toward the salt dome where it can accumulate in a structural trap. The rising salt can also cause faulting. Sometimes these faults allow a permeable rock unit to be sealed against an impermeable rock unit. This structure can also serve as an oil and gas reservoir. A single salt dome can have many associated reservoirs at a variety of depths and locations around the dome. 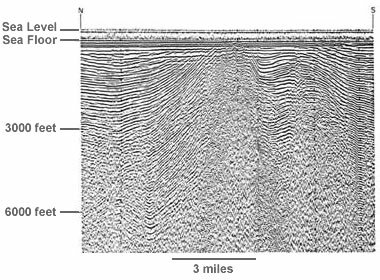 Seismic Survey: An early seismic profile of a salt dome acquired from a shipboard survey. It shows a central salt core about 1-1/2 miles wide and rock layers that were deformed by the upward motion of the salt. Seismic image modified after Parke D. Snavely, United States Geological Survey. Salt domes are sometimes overlain by a cap rock that contains significant amounts of elemental sulfur. The sulfur occurs as a crystalline material which fills fractures and intergranular pores, and in some cases it replaces the cap rock. The sulfur is thought to have formed from anhydrite and gypsum associated with the salt by bacterial activity. Today most sulfur is produced as a byproduct from crude oil refining and natural gas processing. The production of sulfur from salt domes is generally not cost-competitive with sulfur produced from oil and natural gas. Some salt domes have been exploited by underground mining. These mines produce salt that is used as a raw material by the chemical industry and as salt for treating snow-covered highways. A few salt domes have been mined by solution. Hot water is pumped down a well into the salt. The water dissolves the salt and is brought back to the surface through production wells. At the surface, the water is evaporated to recover the salt, or the salty water is used in a chemical process. Geologic Models and Evaluation of Undiscovered Conventional and Continuous Oil and Gas Resources: Upper Cretaceous Austin Chalk, U.S. Gulf Coast; Krystal Pearson, United States Geological Survey, Scientific Investigations Report 2012-5159, 2012. Salt Caverns and Their Use for Disposal of Oil Field Wastes: brochure produced by The National Petroleum Technology Office, Argonne National Laboratory, 1999. Spindletop: The Original Salt Dome: Michel T. Halbouty, article published on the WorldEnergySource.com website, 2009. Salt Domes on Melville Island: Jesse Allen, NASA Earth Observatory, Image of the Day for August 27, 2006. Sir Bani Yas Island, United Arab Emirates: Astronaut photograph from the International Space Station, NASA Earth Observatory, Image of the Day for March 15, 2010. Some of the mines developed in salt domes have been carefully sealed and then used as storage sites for oil, natural gas, and hydrogen. Salt domes in the United States and Russia also serve as national repositories for government reserves of helium gas. Salt is the only type of rock that has a permeability so low that it can hold the tiny helium atoms. Salt is an impermeable rock that has the ability to flow and seal fractures that might develop within it. For this reason, salt domes have been used as disposal sites for hazardous waste. Man-made caverns in salt domes have been used as repositories for oil field drilling waste and other types of hazardous waste in the United States and other countries. They have also been considered for high-level nuclear waste disposal, but no site in the United States has received that type of waste. Where Do Salt Domes Occur? Salt domes can occur in sedimentary basins where thick salt deposits have been buried by at least 500 feet of other types of sediment. One of the world's largest salt dome regions is the Gulf of Mexico. 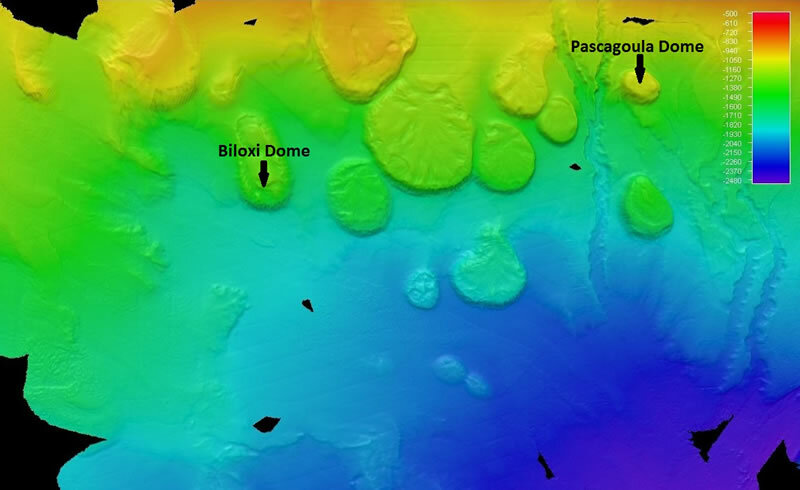 Over 500 salt domes have been discovered onshore and under the Gulf of Mexico seafloor. They originate from the Louann Salt, a subsurface rock unit that is laterally persistent throughout the area. A map in the right column of this page shows the location of bedded salt deposits in the United States and three salt dome fields. Large fields of salt domes have also been discovered in Angola, Brazil, Canada, Gabon, Germany, Iran, and Iraq.